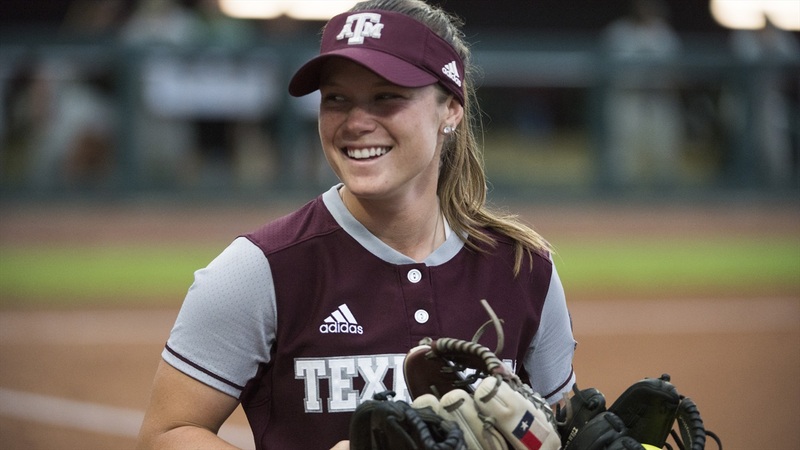 The Aggie softball team (43-16 13-11 SEC) bested Baylor, 10-4, in the championship of the College Station Regional at Davis Diamond, punching its ticket to the Super Regional round. The Aggie offense exploded and put up seven runs in the fifth inning, and the bullpen took care of the rest. After trading blows with the Bears for the first half of the game, the Aggies blew the game wide open in the fifth. Sarah Hudek got things started with a single and a stolen base. A few batters later, Kelbi Fortenberry delivered for the second time with an RBI-double to left field, scoring Hudek. Later in the inning, Kristen Cuyos worked an RBI walk with the bases loaded and two away. Erica Russell then cleared the bases with a three-run double to the corner in right field. Samantha Show put an exclamation point on the frame by cranking a two-run shot to deep left-center field. The Aggies scored six of the seven runs in the inning with two outs and posted their most runs in an inning in the 2018 season. Evans said she was proud of the moxie her team displayed at the plate to score six runs with two outs in the fifth inning. 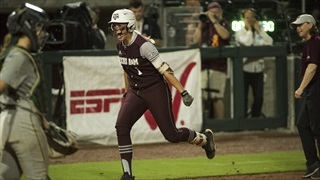 Texas A&M lit up the scoreboard in the fifth inning, plating seven runs to put the game out of reach and earn a Super Regional bid. The Bears drew first blood in the bottom of the first. After two back-to-back singles and a walk to load the bases, Goose McGlaun hit an RBI-ground out to second base for Baylor’s first run of the game. Baylor added to the lead in the bottom of the second as Kyla Walker drove a liner down the left field line for an RBI-double, scoring Hannah Smith. A&M answered in the top of the third inning. With two away and Erica Russell on second base, Tori Vidales drove a run in with a hard-hit ball to the shortstop. After Vidales took second on a wild pitch, Kelbi Fortenberry capitalized by bringing her in by driving an RBI-single into left center field. Baylor erased A&M’s lead quickly in the following half-inning. McGlaun did more damage by driving an RBI-double to left center field, scoring Alyssa Avalos. The Bears scored again in the bottom of the fifth on a solo shot from Shelby Friudenberg. The Maroon and White tacked on another run as Riley Sartain drove an RBI-single to the shortstop. Lexi Smith started for the Aggies and tossed three innings, surrendering six hits and three runs before handing the ball to Payton McBride (2-0, 2.15 ERA) in relief. McBride navigated through an inning and two-thirds, giving up a run and pitching her way to a win for her team. Trinity Harrington took over for McBride and was able to finish off the game, working two and a third scoreless frames. A&M will return to action May 24 as they travel to take on the Florida Gators in Gainesville, FL. First pitch is TBA.